Compared with economically ideal policies, actual limits on global warming gases are likely to be "second-best" in many ways. Most studies focus on "second-best" approaches such as delaying emission controls in developing countries, constraining international emission trading, or regulating gases piecemeal by sector rather than equally across the whole economy. We show that another second-best approach--lacking of regulatory credibility--imposes up to six times the extra costs on the economy when compared with all other "secondbest" factors combined. When regulatory rules are not believable then firms and other agents become short-sighted and unable to make optimal investments in research and development as well as long-lived technologies. Although analysts have largely ignored this issue, low credibility is commonplace when governments tackle international problems because international institutions such as treaties are usually weak and fickle. Governments can help solve credibility problems with strategies such as "pre-committing" regulations into domestic law that is usually more credible than international commitments. We show that China, for example, can justify unilateral, emission controls because such pre-commitment would encourage Chinese firms to invest with a clearer eye to the future. This paper analyzes the oil price-macroeconomy relationship using a model that aims at taking into account all the sources of instability highlighted by previous studies. Mainly, we adopt a sectoral approach and weight oil prices by sectoral energy intensities. Further, inspired by Alfred Marshall's treatment of time, we also put forward a new approach to model short-term interactions between economic variables that relies on an error-correcting mechanism depending on cumulative errors. Applied to the U.S. economy, our model enables us to estimate stable relationships between oil prices and sectoral economic indicators. Further, it explains both the long-run weakening of the relationship between oil prices and aggregate economic activity and its short-run instability. We show that the oil price-macroeconomy relationship is fading but the oil price-microeconomy relationship is alive and well. This paper evaluates with numerical computations the respective merits of two competing notions of coalition stability in the standard global public goods model of climate change. To this effect it uses the CWS integrated assessment model. After a reminder of the two game theoretical stability notions involved--core-stability and internal-external stability--and of the CWS model, the former property is shown to hold for the grand coalition if resource transfers of a specific form between countries are introduced. The latter property appears to hold neither for the grand coalition nor for most large coalitions whereas it is verified for most small coalitions in a weak sense that involves transfers. Finally, coalitions, stable in either sense, that perform best in terms of carbon concentration and global welfare are always heterogeneous ones. Therefore, if coalitional stability is taken as an objective, promoting small or homogeneous coalitions is not to be recommended. Whether companies invest in new power facilities at a particular point in time, or delay, depends upon the perceived evolution of uncertainties and the investors' attitudes to risk and return. With additional risks emerging through climate change mitigation mechanisms, the propensity to invest may increasingly depend upon how each technology and company is exposed to carbon price uncertainty. We approach this by estimating the cumulative probabilities of investment over time in various technologies as a function of behavioral, policy, financial and market assumptions. Using a multistage stochastic optimization model with exogenous uncertainty in carbon price, we demonstrate that detailed financial analysis with real options and risk constraints can make substantial difference to the investment propensities compared to conventional economic analysis. Further, we show that the effects of different carbon policies and market instruments on these decision propensities depend on the characteristics of the companies and may induce market structure evolution. We propose a price-cap mechanism for electricity-transmission expansion based on redefining transmission output in terms of financial transmission rights. Our mechanism applies the incentive-regulation logic of rebalancing a two-part tariff. First, we test this mechanism in a three-node network. We show that the mechanism intertemporally promotes an investment pattern that relieves congestion, increases welfare, augments the Transco's profits, and induces convergence of prices to marginal costs. We then apply the mechanism to a grid of northwestern Europe and show a gradual convergence toward a common-price benchmark, an increase in total capacity, and convergence toward the welfare optimum. A warmer climate may result in lower thermal efficiency and reduced load--including shutdowns--in thermal power plants. Focusing on nuclear power plants, we use different European datasets and econometric strategies to identify these two supply-side effects. 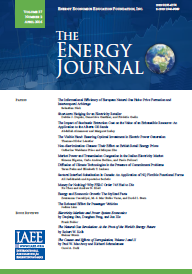 We find that a rise in temperature of 1rC reduces the supply of nuclear power by about 0.5% through its effect on thermal efficiency; during droughts and heat waves, the production loss may exceed 2.0% per degree Celsius because power plant cooling systems are constrained by physical laws, regulations and access to cooling water. As climate changes, one must consider measures to protect against and/or to adapt to these impacts. In the literature, one approach is to analyse gas storage within a simple one-factor price dynamics framework that is solved to optimality. We follow an alternative approach, where the market is represented by a forward curve with daily granularity, the price uncertainty is represented by six factors, and where we impose a simple and intuitive storage strategy. Based on UK natural gas market price data, we obtain the gas storage value using our approach, and compare with results from a one-factor model as well as with perfect foresight. We find that our approach captures much more of the true flexibility value than the one-factor model.